Are you searching a good quality mechanical keyboard? If you are confused which one to buy, you’re not alone. Mechanical keyboards are the new fad amongst gamers and professionals. This is not a niche audience anymore. Everyone these days want one. But, which one to go for? There are tenkeyless mechanical keyboards, wireless mechanical keyboards, and wired options. Since we already did a post on regular keyboards, this article would be focussed on wireless mechanical keyboards only! Here is our list of wireless mechanical keyboards, where we picked up the ones that are popular amongst the masses. It might help you in choosing the best option as per your budget and requirement. The market is already full of membrane keyboards that are relatively cheap and is of slightly low quality, but not always. The feel of typing that you get on the mechanical switches is way better than the membrane keyboards. 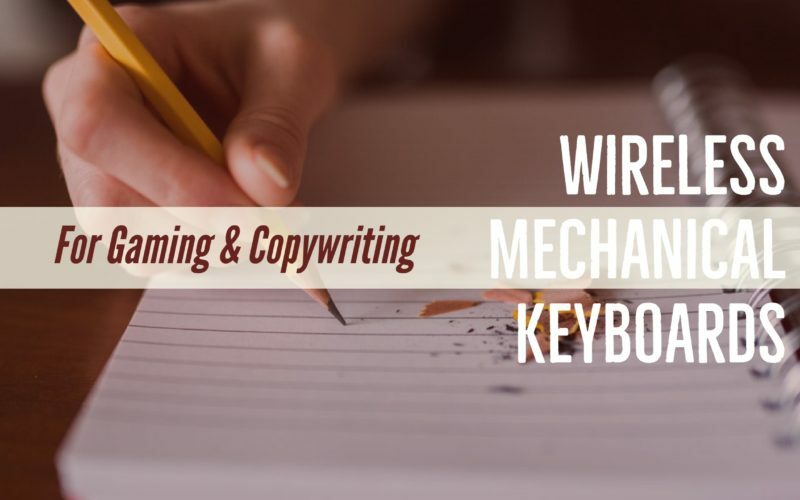 Mechanical keyboards use metal spring for the actual mechanism of keystrokes and have a much longer lifespan. Most of the mechanical keyboards are tested for 30 to 70 million key presses, while the standard membrane keyboards will offer you only 5 million key presses. Plus, mechanical keyboards seldom has wear and tear on the buttons. Even after years of heavy usage, you will still feel like you are typing on a new keyboard. Plus, the improved typing experience is a bonus. These are more robust and stable as they are more substantial than membrane or scissor keyboards. But there is a minor problem in using mechanical keyboards; they are a bit louder than other types of keyboards. Some take it as an advantage while for some the relatively noisy key presses are disturbing. It is particularly true on office environment. Even in a library, one cannot think of using a mechanical keyboard. Since you are already here, we are guessing that you already know about this. Personally, I like the mechanical keyboards especially with wireless connectivity as you get the freedom, durability and improved typing speeds. What more an article writer will look for in a keyboard, right? Now you have got a basic understanding of mechanical keyboards, let’s move on to the list to help you out in choosing the best wireless mechanical keyboard for your PC. Mechanical keyboards are ideal for almost all types of operation, whether you are playing games, typing data or coding. Velocifire is the most affordable wireless mechanical gaming keyboard that we have on this list. No wires, no clutter that’s where it stands ahead of other mechanical keyboards that don’t come with wireless connectivity at the same price. It uses a 2.4 GHz wireless connection using a tiny USB receiver. You will get a pretty decent wireless range of approximately 33 feet. Of course, the range will differ based on scenarios. It can be recharged back using a micro-USB cable even while if the keyboard is in use. With a single charge which takes around 3 hours, it will last for 30 days. It is a plug-and-play device and requires no software installation. The keys are easy to press, and the company claims that you will give you around 50 million key presses. If you need a compact wireless mechanical keyboard, Drevo’s Calibur could be a great option for you. It works on Bluetooth 4.0 and is compatible with PC, Android, and MAC. It features 71 keys with customizable backlighting. A true NKRO prevents key ghosting. The high-quality keycaps stay clean. It comes with seven different backlit lighting effects with presets that will not conflict the customizable lights. Having Bluetooth 4.0, it is not limited to just MAC or PC; you can even connect it to smartphones and tablets. It is handy, comfortable to type on and portable for everyday work if you are okay with the weight. Overall, at this price, it offers you the best combination of features and quality. 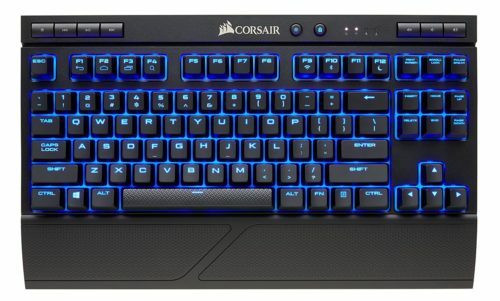 Corsair K63 is not like the above two keyboards. It is more advanced, more comfortable and more durable and will cost you more. It gives you unmatched typing experience that is a combination of tactile feel and incredible craftsmanship. It is made of the high-quality materials that make it robust. The gold-plated mechanical switches will last up to 50 million keystrokes, and that is a lot! It works on the standard wireless 2.4 GHz connection that has a reported rate of 1 ms of response times. Plus, it also has low-latency Bluetooth and USB wired option. So you get plenty of connectivity options that are missing on the other keyboards on this list. The strong 128-bit AES wireless encryption helps protect your keystrokes from wireless eavesdropping and keeps your data safe. It is compact, and portable thus doesn’t take much of your desk space. The inbuilt battery gives around 15 hours of usage time with the standard brightness of backlit and 75 hours without backlighting. You can switch to the USB wired connection for uninterrupted gameplay. Also, there are seven dedicated multimedia and volume control keys to adjust track and audio on the fly. A detachable soft-touch wrist rest pad to keep your wrist comfortable. No doubt, Logitech has earned quite a good reputation in the computer and smartphone accessories department. Logitech G613 is a full-size wireless mechanical gaming keyboard. It is for all those who need high performance of mechanical switches and freedom of wireless connectivity. It works on lightspeed wires technology that has a report time of 1 ms and Bluetooth for multi-host connectivity. Logitech G613 offers 6-programmable G-keys and a fantastic battery life using only 2 AA batteries that can be used up to 18 months. When the battery goes below 15 %, the LED indicator turns ON. When the battery runs out, you can use the included USB cable for uninterrupted gameplay. The Romer-G key switches have long lasting durability of 70 million keypresses that is so far the most of all the wireless mechanical keyboards in this list. The Logitech G613 comes with the following accessories, LIGHTSPEED USB receiver, phone stand in case you want to connect this keyboard to your smartphone, an extended USB cable, 2 AA batteries, and guide. Still, if you are not convinced, the G613 is backed by 2-year limited hardware warranty. I know, this is a short list. But wireless mechanical keyboards are rare and we didn’t even notice. We hope you like our list of Wireless Mechanical Keyboards currently available. If you have any feedback to share, do not hesitate to drop us a comment below. Thanks for visiting us!